Heat oven to 350°F. Line bottom only of 13x9-inch pan with foil; spray foil with nonstick cooking spray. In large bowl, beat cream cheese at medium speed until light and fluffy. In medium bowl, combine sugar, malted milk powder and cocoa; mix well. Add to cream cheese; beat at low speed until combined. Beat at medium speed until smooth. Add sour cream, vanilla and salt; beat well. Add eggs 1 at a time, beating just until combined after each addition. Pour batter into sprayed foil-lined pan. Place pan in larger shallow pan; place in oven. Add hot water to shallow pan until half full. Bake at 350°F. for 50 to 55 minutes or until set. Remove from oven. Remove cheesecake from water bath; place on wire rack. Cool in pan 1 hour or until lukewarm. Carefully invert cheesecake onto cookie sheet. Refrigerate at least 3 hours or overnight. In small bowl, beat whipping cream until stiff peaks form. 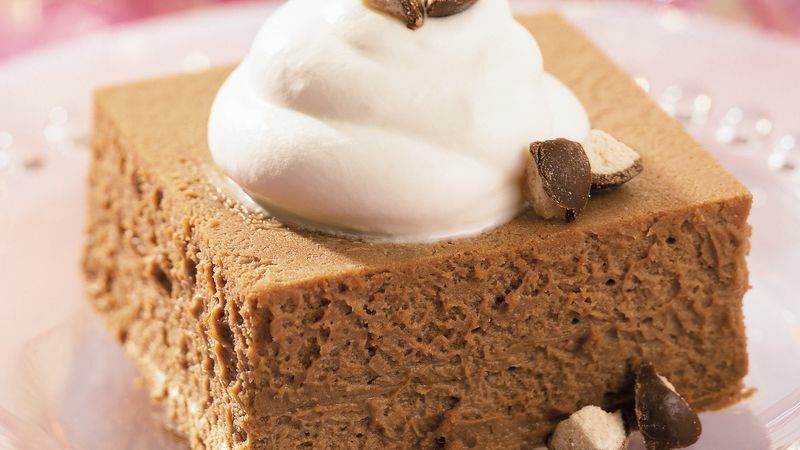 Cut cheesecake into squares; place on individual dessert plates. Top with whipped cream and chopped malted milk balls. Store in refrigerator.